How to Make Hot Buttered Toast! TO MAKE HOT BUTTERED TOAST. A loaf of household bread about two days old answers for making toast better than cottage bread, the latter not being a good shape, and too crusty for the purpose. Cut as many nice even slices as may be required, rather more than 1 inch in thickness, and toast them before a very bright fire, without allowing tho bread to blacken, which spoils the appearance and flavour of all toast. When of a nice colour on both sides, put it on a hot plate; divide some good butter into small pieces, place them on the toast, set this before the fire, and when the butter is just beginning to melt, spread it lightly over the toast. 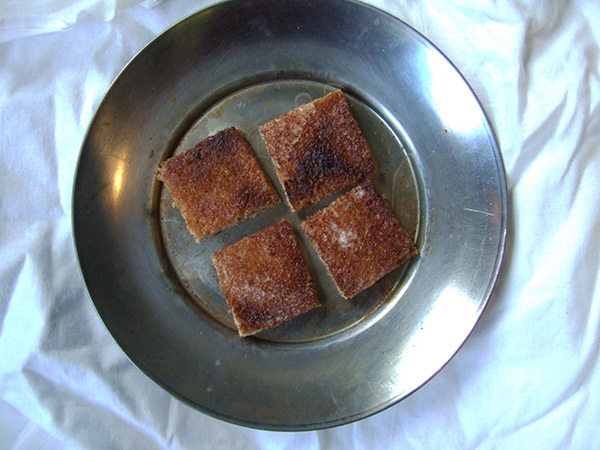 Trim off the crust and ragged edges, divide each round into 4 pieces, and send the toast quickly to table. Some persons cut the slices of toast across from corner to corner, so making the pieces of a three-cornered shape. Soyer recommends that each slice should be cut into pieces as soon as it is buttered, and when all are ready, that they should be piled lightly on the dish they are intended to be served on. He says that by cutting through 4 or 5 slices at a time, all the butter is squeezed out of the upper ones, while the bottom one is swimming in fat liquid. It is highly essential to use good butter for making this dish. But I tried her recipe, and I have to admit: it was a great system of toast making. I didn’t use the best butter–just Land o’ Lakes from the fridge. And no open fire: I have a combo pop-up toaster and toaster oven, and used both features to execute this recipe: first to toast the bread, then to melt the butter. But with the double-toasting method she suggests, the butter was evenly distributed and saturated into the surface. The salty fat squeezed out with each bite and oozed over the tongue. The soft squares of toast looked ridiculously small on the plate, but the mouth-feel was almost decadent without the tough and scratchy crusts. Maybe I just have a soft spot for Isabella. She was writing in a time when women weren’t. She was trying to write more specific better organized recipes when recipes were about clear as mud. And she loved her publisher husband fiercely–who also seemed to love her back, but also gave her syphilis (probably). At least she had a handle on toast. Something about this reminds me of an episode of the old Martha Stewart show where she gave a tutorial on how to make ice. I think it might have been a joke, but you can never tell with Martha Stewart! Aw, thanks! Glad you’re enjoying it! Exciting that you’re reading her–are you attacking her book, or is there a great biography out about her? Going to try it out? I think I might try a simplified version…my favorite thing about Colonial to 1800s dinners is the symmetry that went into the menu planning and table setting. I would love to pull off a two course dinner party with that much elegance! She is very thorough. Although some historians argue that she just popularized recipes already in existence, thereby taking all the credit for them. Still, she was influential! I feel like her book was intended as a compendium; so all the recipes one needs are in one place. And she strove to make them better organized! I feel her book isn’t do different than the premise of many modern cookbook; our recipe websites for that matter. I also understand that she came from a catering background. It’s one thing to throw together a few slices of toast, and another to make, say 100 slices of toast. You want to break down the steps carefully, when dealing in bulk, in a way that is really useful for a beginning cook. I did not know she came from a catering background! I wish I could remember where I read/heard that, because I cannot find a corroborating reference. I love reading her recipes, myself, and have used several to great success. I’ll soon be moving into a house with a wood stove, and will be sure to add Hot Buttered Toast to my list of Beeton recipes to try out. I was surprised myself!! Perhaps he didn’t know that every cookbook of the time plagiarized; but he also didn’t really acknowledge that the point of the book was that most recipes were submitted by users. I’m not sure what Bryson’s beef is with her; but I did sincerely enjoy At Home.